There is an exhaustive list of things to know about safes before purchasing one, and this research is absolutely essential for making a smart buy. These security containers are an investment, and they are designed to protect even more valuable investments. It makes sense, then, that a buyer would want maximum protection from burglary and fire. But how can a buyer be guaranteed of the protection level of the product? What should a buyer look for? As it turns out, quite a bit. Burglary rating – It all starts here. Above all else, the container must protect against burglary, and the best way to summarize the container’s ability to do so is with its Underwriters Laboratories (UL) rating. UL is responsible for performing intense cracking tests, and they rate them according to how long it takes to crack through, and the kind of tools needed to do so. It is imperative that the safe come with a UL rating, and at least a Residential Security Container (RSC) rating. If no UL rating label is present on the safe then these safes are generally considered B Class or C Class construction rating safes. These rating only cover the materials used to build the safe, not how well they prevent a burglar’s attempt from gaining access to your valuables. A B-Class safe has a steel door of less then one inch thickness and steel walls of less than 1/2 inch thickness. While a C-Class safe has a steel door of at least one inch thick and walls of at least 1/2 inch thick steel. Neither A nor B Class safes has passed the UL Test Performance Rating. The UL Test Performance Rating ratings include UL RSC (Residential Security Container), UL TL-15, UL TL-30 and UL TL-30×6. A container with a higher number rating takes longer to crack into, and takes more advanced knowledge or tools to successfully breach the container. 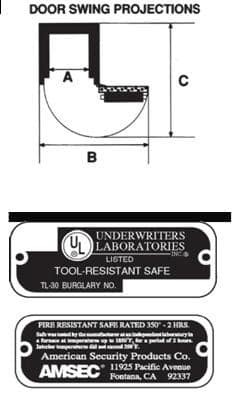 Higher security containers normally come with UL TL-30 or UL TL-30×6 ratings. These safes are exceptionally difficult to crack, and usually require intimate knowledge of the container to get through to its contents. Fire rating – Both UL and Intertek’s Electrical Testing Labs (ETL) test containers for fire protection, and the tests generally go after the same thing. Both ratings include a time value, and this time value represents how long the container can be exposed to a typical building fire before the container’s interior reaches 350 degrees Fahrenheit. Ratings range from 45 minutes to 2 hours, and as most house fires die out within half an hour, UL and ETL fire ratings are strong indicators of protection. Weight – There’s no such thing as a light, portable safe. Any security container that can be easily picked up is not secure at all. For this reason, weight is a significant concern. The heavier the safe, the harder it will be to remove it from the home. Some containers weigh as much as a car, but there’s a double edge to that weight. Some containers are so heavy that they cannot be installed upstairs. The ceiling joists just may not be sturdy enough to handle the load. Wider containers distribute their weight over a larger area, and this can help, but some safes will need to be set on a concrete foundation. For added security, the container can even be installed in the floor, making it almost impossible for thieves to breach the container from the side. Dimensions – Buyers don’t typically overlook security, but they often underestimate how much space they will need for their valuables. Whether the container will be used for documents, money or firearms, consider what will need to be added to the safe in the future. In most cases, it’s best to purchase a container that is a little larger than what is currently needed, so it doesn’t have to be replaced in the near future. Bolting – Bolting provides another layer of security, rendering it impossible by all practical means to pick up the safe and get away with it. Many containers are designed to be compatible with bolting, and it’s ideal for smaller containers that might be at risk of being toted away in the event of a burglary. 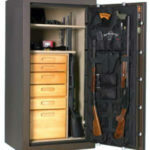 When it comes to selecting a safe for a home or office, consider what they will be relied on to secure. Asset value is a shorthand way of determining what kind of container is needed. For example, a safe with a Class C rating is sufficient for securing up to $50,000 in assets. A UL TL-30×6 should be considered when securing up to $500,000 in assets. In other words, assess the value of what needs to be protected, and consider the container’s burglary rating. A strong fire rating should also be prioritized if paper documents or devices holding data are to be stored inside. Interior temperatures of 120 degrees Fahrenheit are enough to knock out some forms of data storage, so plan accordingly. Beyond those essentials, it is always a good idea to have a respected dealer assist with the purchase and installation process. One wrong move can cause significant damage or injury, and experienced installers will be able to identify possible challenges to setting the safe up. For example, some types of flooring might warp under the weight of a container, and an experienced installer can spot these complications before they become an issue. Those are the basic things to know about safes, but to get the full picture, it’s best to see the product in person before making a final decision. With so many to choose from, it’s an investment that requires careful consideration.